Inter Milan are on a shopping spree this summer transfer period despite the World Cup as they announce the signing of Juventus player Kwadwo Asamoah. The Nerazzurri also announced the signing of defender Stefan De Vrij earlier today. Belgium midfielder Radja Nainggolan moved to Inter Milan from AS Roma last week. The Milan club continue to strengthen their team as they look to take back their place at the top of Italian club football. Inter can announce that a contract has been agreed with Kwadwo Asamoah that will run from 1 July 2018 to 30 June 2021. The Ghanaian player was born in Accra on 9 December 1988 and he’s joined the Nerazzurri after previously playing for Udinese and Juventus in addition to the Ghanaian National Team. Before turning 20, Asamoah moved to Europe and Swiss side Bellinzona. He then moved to Italy to continue his development at Torino's Primavera side. In the summer of 2008, he moved to Udinese where he became a starter in the second half of the season. He stayed in Friuli for four years, establishing himself as one of the league’s most interesting players and contributing to some excellent results for Udinese. He appeared 134 times across all competitions, also making his debut in the Europa League and featuring in the preliminary round of the Champions League in the 2011-12 season. He scored eight goals for the club. In July 2012, Kwadwo was signed by Juventus. In six seasons in Turin, he won 13 trophies, featuring 156 times and scoring five goals in Serie A, the Coppa Italia, Supercoppa Italiana, Champions League and Europa League, bringing a valuable mix of versatility and reliability. 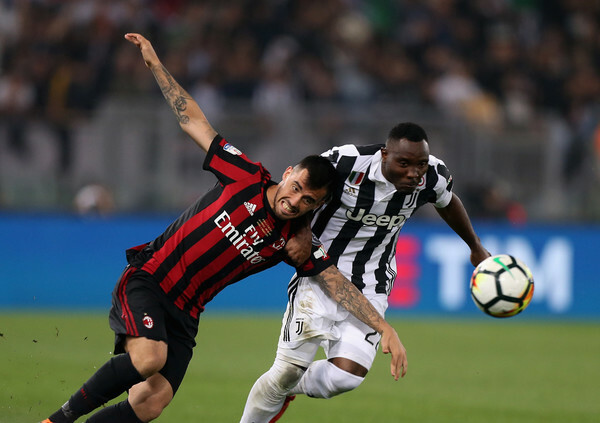 Asamoah was equally effective as a left-back, wide midfielder or holding midfielder, earning the unconditional trust of his coaches and teammates. Asamoah has so far made 69 appearances and scored four goals for Ghana, finishing third (2008) and second (2010) in the African Cup of Nations. He also took part in the 2010 World Cup in South Africa. Now, a new chapter is starting for Kwadwo with the Nerazzurri. #WelcomeAsamoah and best of luck for this adventure at Inter!